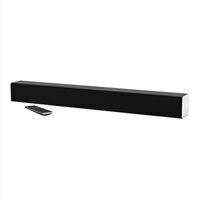 VIZIO SB2820N-E0 - Sound bar - for home theater - wirelessImmerse yourself in the entertainment you love. Experience true surround with crystal clear dialog and booming bass. VIZIO has the right sound for any space. Fill any room, large or small, with epic audio. Discover 2.0, 2.1 and 5.1 sound bar systems. From massive explosions to faint whispers, experience every detail in amazing clarity with less total harmonic distortion. From the roar of a concert to the rumble of your party playlist, the sleek wireless subwoofer delivers room-shaking bass. VIZIO SmartCast sound bars are crafted with intelligent audio technologies in cinema quality sound. Immerse yourself in the entertainment you love. Experience true surround with crystal clear dialog and booming bass. VIZIO has the right sound for any space. Fill any room, large or small, with epic audio. Discover 2.0, 2.1 and 5.1 sound bar systems.